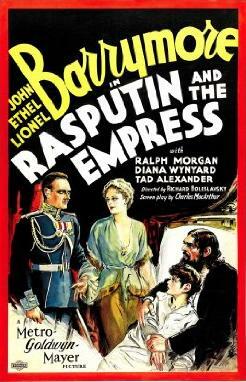 Rasputin and the Empress is unique in film history in that it is the only film where all three Barrymore siblings (John, Lionel, and Ethel) ever appeared in film together. Given that, one would expect that all the stops be pulled to put them all together. However, Rasputin and the Empress fails to give them much to do together despite both their collective talents and the sad tale of the Romanov's fall. For those who aren't familiar with history, here's a little primer. Moscow 1913. The Romanov (or Romanoff as it appears in the film) Dynasty celebrates their Tri-Centennial: Three Hundred Glorious Years as Czars of All The Russias. 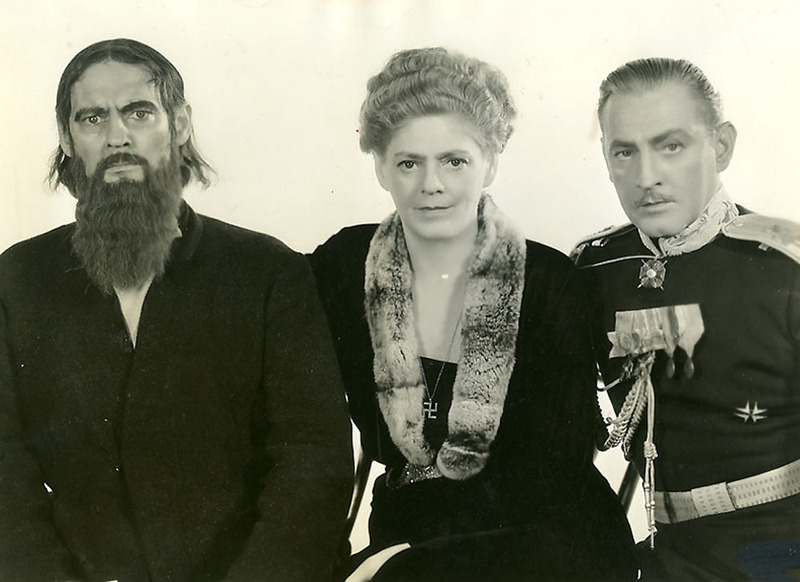 The current Czar, Nicholas II (Ralph Morgan) and the Czarina Alexandra (Ethel Barrymore) think things are going well despite the secret they are hiding: that the Czarevitch Alexei suffers from hemophilia. 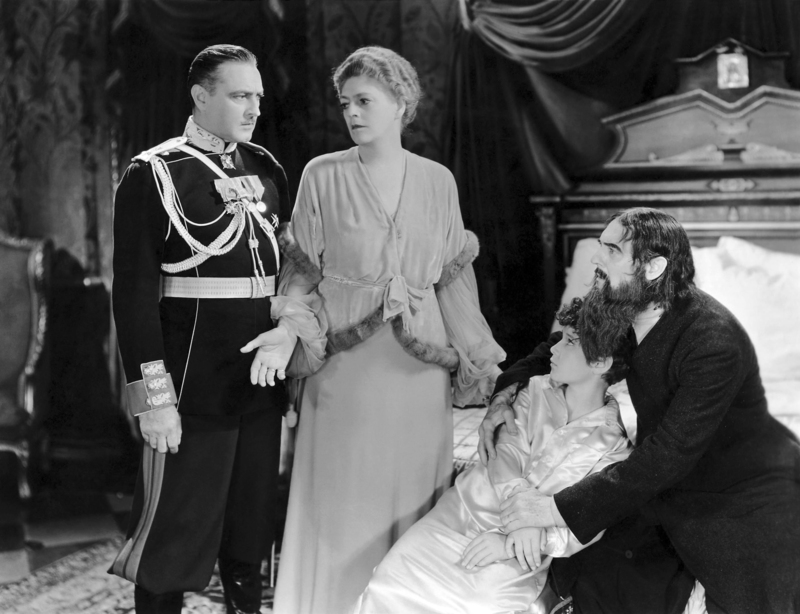 However, Prince Paul Chegodieff (John Barrymore) fears that revolution is in the air since the people's genuine grievances are being ignored. Loyal to the Romanovs, Prince Paul is the only man of conscience in Mother Russia with noble rank. He also is the Czarina's friend, especially when her German heritage is brought up. As the Czarevitch runs the risk of death after a fall, in desperation at the urging of a lady-in-waiting, Princess Natasha (Diana Wynyard), the Czarina calls on Gregory Rasputin (Lionel Barrymore), a holy man who claims to have the power to heal. Somehow, he is able to stop the heir's internal bleeding, instantly winning the trust of the Czarina. However, Prince Paul is highly suspicious of Rasputin, in particular when he learns of his debauchery. Rasputin soon begins to have greater influence over the Romanovs, down to making 'suggestions' of political appointees. His own coven of attenders, made up of the elites and the lowest rung of society, along with his boorish behavior, appear to both shock and amuse the Russian nobility. All this time though, the Romanovs are unaware of Rasputin's private activities and if someone at Court should even suggest something untoward about him, it is dismissed as the work of 'enemies'. At one point, Rasputin appears to hold almost hypnotic power over Alexei, and when Prince Paul protests to the Czarina about this (if memory is correct, Rasputin gets the Czarevitch to bite his once good friend the Prince), Alexandra takes Rasputin's side over her friend. However, Rasputin goes one too far when he appears to almost openly lust after one of the Grand Duchesses and is close to overpowering the once-loyal Princess Natasha. The Czarina, shocked at what she witnesses, forces Rasputin out. The Mad Monk still holds powerful friends, and it all comes down to a fateful dinner where Prince Paul attempts to assassinate him with poison cakes. Despite one of them containing enough poison to kill many men, Rasputin takes many and still lives. Paul is forced to shoot him down and somehow Rasputin is finally killed off. However, comes sweeping in the Russian Revolution, and with that the violent end of the Romanov Dynasty. Rasputin and the Empress is more than just bad history. It's bad filmmaking, and that might be the bigger sin. That is no reflection on the Three Barrymores for each of them was strong in their individual performances. Lionel Barrymore makes the crazed Rasputin into the figure of total evil and greed. His first appearance on screen is appropriately creepy and he maintains an almost egoistic view of himself as almost the true and legitimate ruler of all the Russias. His brother John is the stoic and noble nobleman, one who is sympathetic to both the people and the monarchy. As a side note, Rasputin and the Empress never loses an opportunity for "The Great Profile" to show us his literal best side. It might turn into a good drinking game to see how often we get to see his left side on screen or how scenes are set up to showcase his visage. Ethel Barrymore captured the lost and haunted Czarina who turned to 'her friend' to ease her fears for her only son and heir to the Romanov throne. Alexandra's loyalty to Rasputin is thorough, and it's only when she is witness to his vile acts that she finally sees what has been going on. As I said when it came to the Barrymores I have nothing but praise for how they worked. However, the film fails them and fails them spectacularly. Rasputin and the Empress soon becomes a slow, creaking, and boring film, bogged down by a great deal of bad editing that doesn't so much confuse things as it does make everything a jumble. It failed spectacularly to integrate newsreel footage into the film. Worse, Richard Bolelawski's directing was boring and unimaginative. Even worse, Charles McArthur's screenplay could not get the Barrymore Siblings to appear in the same film together. That is ostensibly the selling point of Rasputin and the Empress but the film only managed to get all three of them for two scenes. Granted the nature of the story would make having the Czarina, Prince Paul, and Rasputin share screentime a bit difficult, but somehow when you have the Three Barrymores together in a film (particularly Ethel, who was never as interested in being a film star as her brothers were, them having appeared together in films already in such films as Grand Hotel and Arsene Lupin) one would hope they could do more together. Sadly, for those who are expecting to see the Three Barrymores together in a movie, be prepared to see them share the screen in only two scenes. There are various scenes of two of them working together (Lionel and Ethel, Ethel and John, John and Lionel) but somehow one would have hoped that we would have the opportunity to see the three members of one of the great American acting families together for much longer than we did. McArthur's screenplay is worse when it comes to historical accuracy. One should never expect total fidelity to history in a film, but even by the standards of filmmaking Rasputin and the Empress is shameful. In the film, Czar Nicholas II appears to be a passionate reformer, even saying that he wished to create a Parliament, or Duma, for Russia. In reality, the Czar was a firm believer in the divine right of kings and at one point told the people that the idea of a Duma was a 'foolish dream'. The only reason there was a Duma was because the Czar of All the Russias was forced into it. Nicholas II was many things: nice guy, excellent photographer, passionate about his wife and children, but reformer he was not. In many ways, he was quite reactionary against any whiff of revolution. The biggest scandal about Rasputin and the Empress was over the Princess Natasha character. Based on Princess Irina Yusupov, she had been the wife of Prince Felix, one of Rasputin's killers. So outraged was Prince Felix of the suggestion in the film that Rasputin had raped his wife (or perhaps worse, that she was a willing lover) that His Highness sued MGM and won. This case led to the familiar "any resemble to anyone living or dead is purely coincidental" tagline that is now standard on films as a way of protecting them against slander suits. Rasputin and the Empress is a great story that sadly was lost to a lack of imagination. Not having the Three Barrymores in their only film together share more screentime was a poor decision. The heavy reliance on stock footage was a bad mistake. Each Barrymore was excellent in their role and that might make it worth watching. However, I found it slow and dull and a waste of an excellent opportunity, which made it all the more frustrating.